I've had this pot for ever, it's pretty but I was tired of it and wanted it to blend in with my color scheme. What's a girl to do? paint it of course. It's one of those pots that you find around the holidays filled with bath and body goodies, nothing special.So I didn't feel bad about altering it at all. After I painted it I did an image transfer using the same technique that I used for my French bumblebee tray. I mixed together some black and white paint and made a dark gray, thinned it down to a wash and painted it around the rim. Then wiped it back for a little distressing. After the paint dried aided by my blow dryer, I wiped on a couple of coats of satin poly. 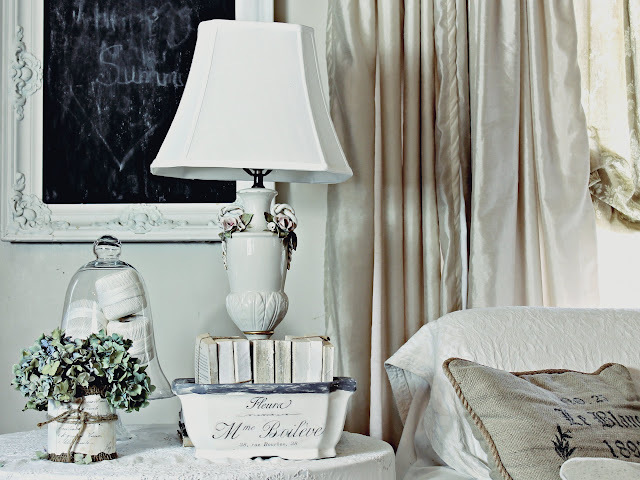 I added my distressed book bundles to it and made a vignette on my side table. I love your "new" pot. Really like the graphic and the entire vignette. I can't believe you got that lamp for just $3.50. Wow! What a great find. Your old/new pot is beautiful! The lamp was a wonderful find! LOVE what you did with the pot, but the whole vignette looks so nice! Beautiful! I would never have thought to do something like that. I am slowly being educated here in Blogland!! Nicely done, Karen! I love the detail you added to the front with the transfer image. The vignette came together beautifully! I love your re-do on the pot...looks fantastic! Hi - I am your newest follower. I love your ideas and thrift store transformations! I look forward to following your blog and getting more great ideas. Have a good week. What a lovely transformation! Love it. I love this pot redo. It is spectacular. Just beautiful. I'm in love with that little container. Everything about it is too perfect. From the painting to the graphic to the bundle of books inside. You have such a great eye! A gorgeous transformation! I just found your link on Savvy Southern Style and I am now following you. Thank you for your inspiration! I love what you did to that pot. The before was pretty, too, but this is better. I have some canisters that I was going to try this on. So glad to see it works. Looks great. Hi Karen: This is so beautiful--I had no idea you could transfer an image onto china. I am definitely going to have to give this a try. Thank you for the inspirational post! Lovely pot! I am hosting Giveaway where you could win a 50 dollar gift card to the store HomeGoods. I would love to see you at My Dream Canvas. The new pot is definitely better - love your whole vignette and everything in it ! The pot and your vignette are so pretty. What a great new look for the pot. Nice job with the distressing and adding the graphic. I like your tin can idea, too. What a great transformation. You have some really nice bargains here. It all looks so nice! Love this transformation - so pretty! This is a fabulous transformation. Not only did you create a new treasure, but your vignette is a feast for the eyes too. Love it! Cannot believe you got that lamp at the Goodwill. What a find! This whole post is just lovely. Photos are lovely too. How pretty it is! I love it! I would have never thought to paint a pot like that! Thanks for the inspiration! 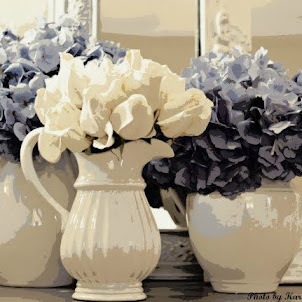 This a gorgeous vignette, you amaze me with how cleverly you style things! I didn't know you could paint over these pieces?! Now I will surely keep my eyes peeled for some redo candidates. Yours is gorgeous! Thanks so much for sharing with us. Beautiful! I had used crochet yarn like that mounded in the urns flanking my fireplace mantel, I happened to find HUGE cloches that fit on top perfectly! I might have to go and put them back like that again! I was about to fill them with sea shells. . .